With a coat of paint and some new hardware, we’ve completely changed the look and feel of this old dresser and gave it a new life! 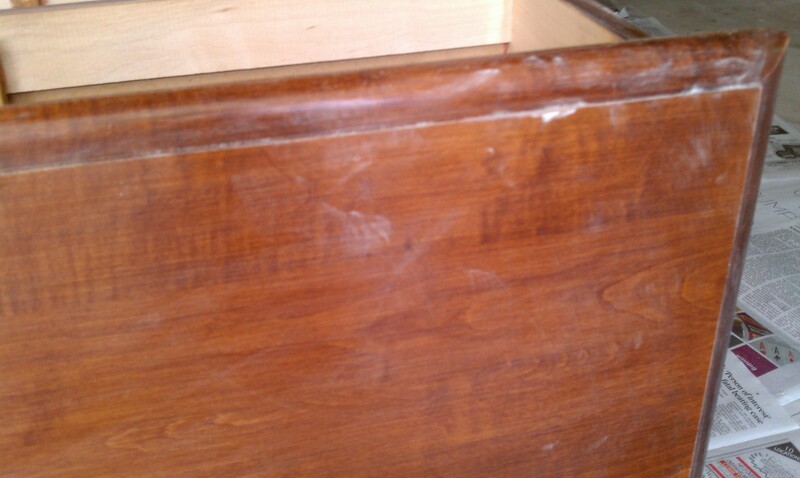 As I mentioned in a previous post, this dresser dates back to Dan’s childhood. He and his brother each had one in their rooms growing up. 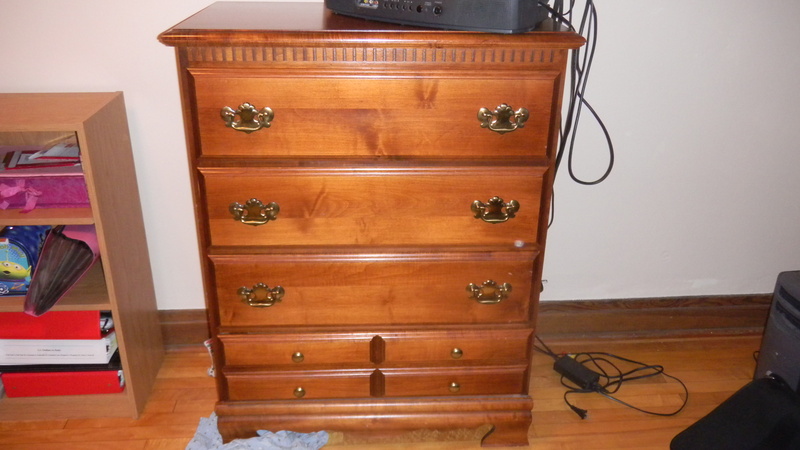 When Dan moved out, he took this dresser with him. It made its way over to our place, where it sat in Dan’s closet until recently. Now, it’s hanging out in the office and giving me tons ‘o storage space for my scrapbooking supplies and work binders. Let’s do a step by step of the transformation. First of all, we knew the color would have to be changed to be a better fit in our light and airy office. 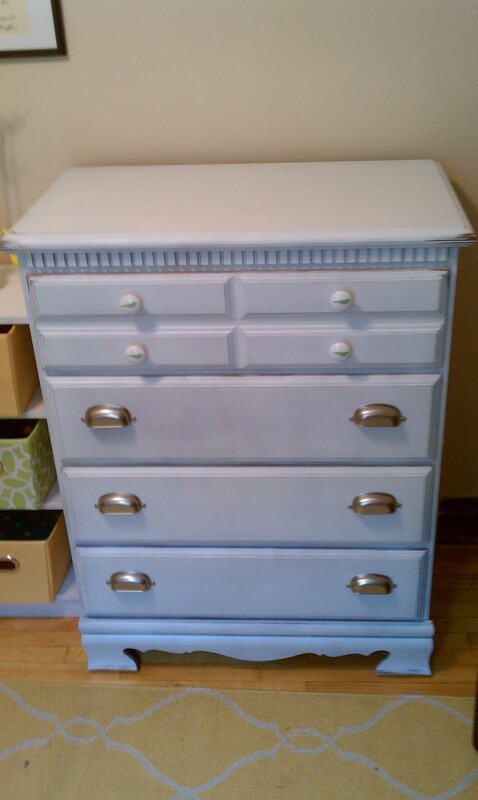 We recently went on a painting furniture white spree, and this was the final piece. Dan started by removing all of the hardware. We put it in a baggie so we wouldn’t lost any of the pieces. We knew we wouldn’t use them again, but maybe sometime down the road we’ll find someone who can. Then, he sanded, and sanded, and sanded. Next, grab that spray paint! He primed the dresser and sprayed it white. This is one coat. It took quite a few. 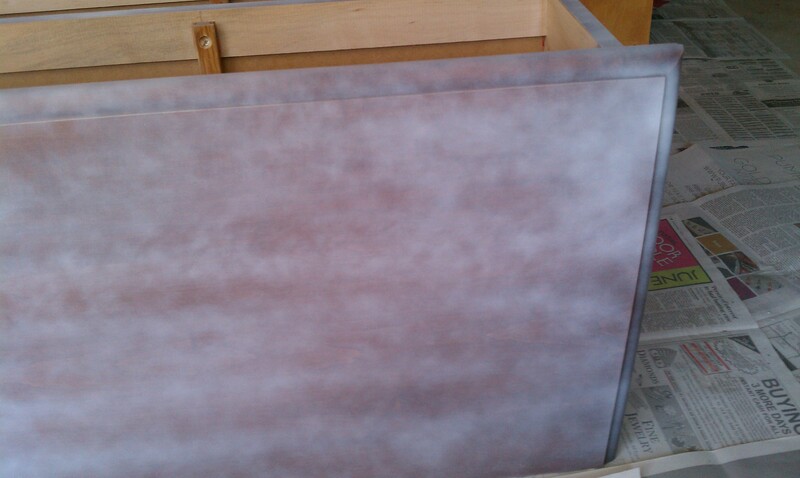 But even after two coats of primer and two coats of semi-gloss, the coverage didn’t look fully even. Dan didn’t like it but I thought it just added to the dresser’s charm. Besides, we had plans to distress it, so it wasn’t like we wanted it looking perfect. 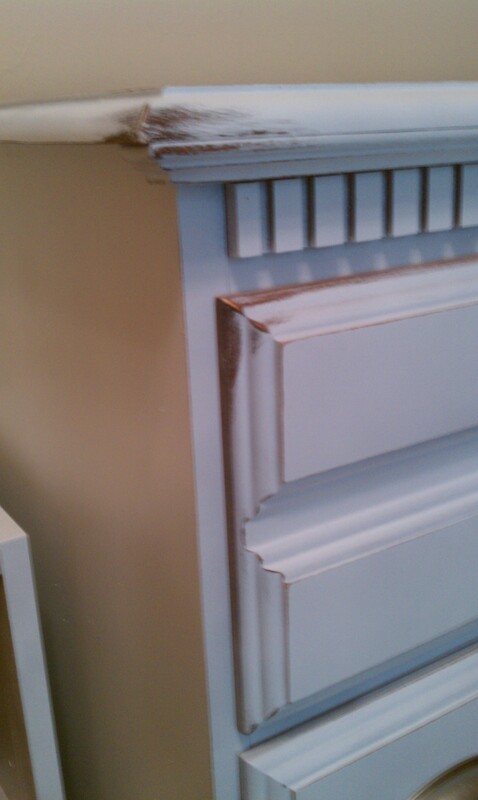 Once the paint was dry, Dan got to distressing it by lightly sanding on the places a dresser might get worn. There are other ways to faux-distress furniture (like rubbing candle wax on those same spots before painting), but this way is easy, and in most places, we got just the effect we were looking for. 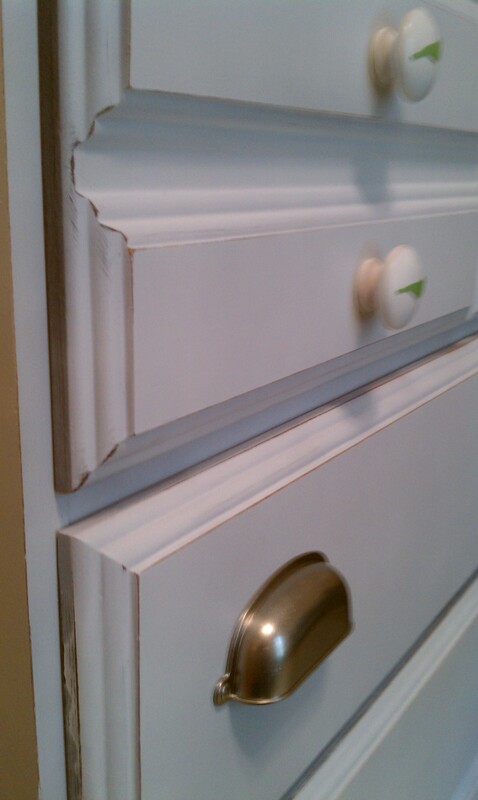 Dan carried the huge dresser back up to the office and added on the hardware we had already purchased from Home Depot. 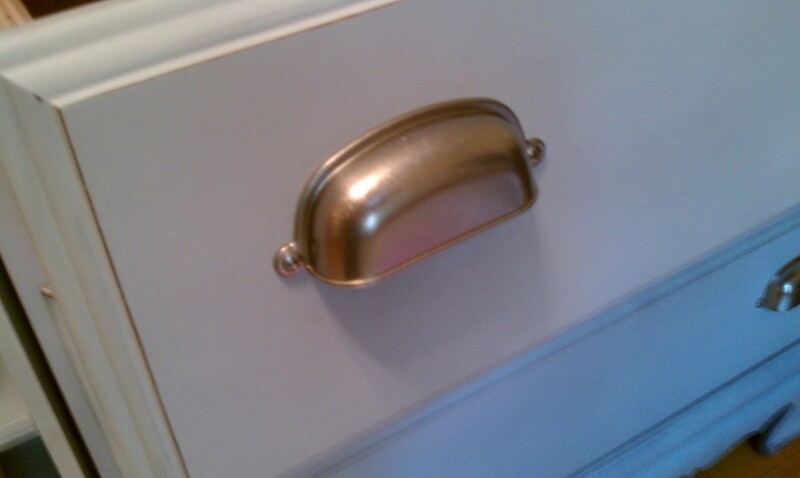 In case you’re wondering, it’s the Martha Stewart Living Classic Polished Nickel Canopy Cup Pull. For the top drawer, that required knobs, I decided to do a little something different. 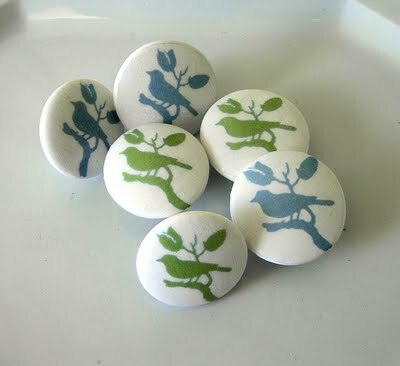 I had seen these bird knobs, and was inspired to make my own. I changed up how to make them, so it Iwasn’t as difficult as the tutorial in the link. 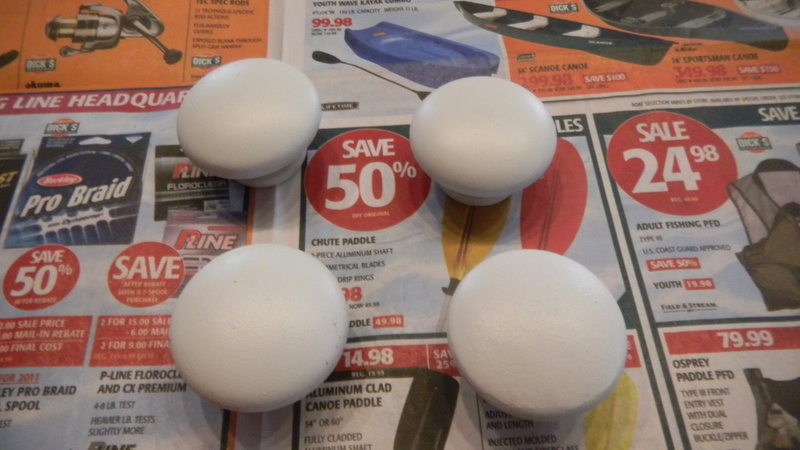 I started with some plain wooden knobs from Home Depot. They got two coats of white spray paint, and then were left to completely dry. 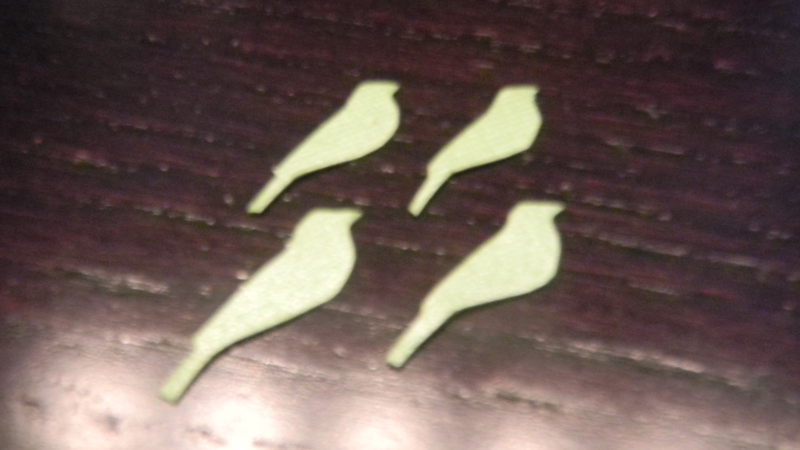 In the mean time, I printed out the silhouette of the bird that was used in my inspiration knobs. 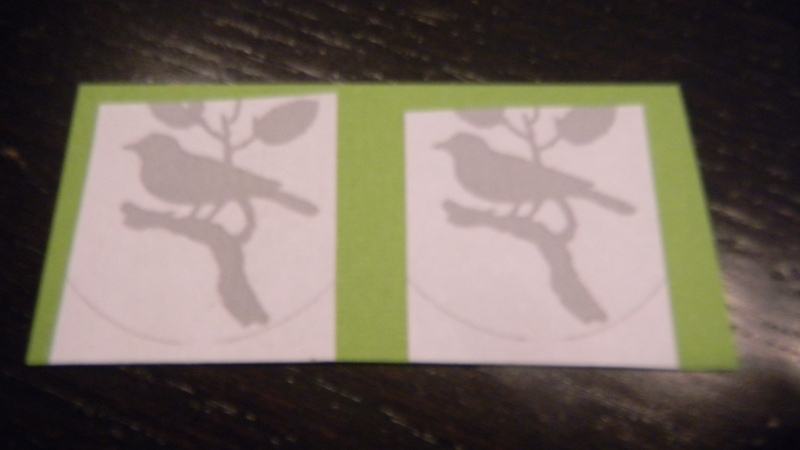 I cut out just the bird part (not the branch or leaves) and used that as a stencil on some green scrapbook paper. I did that four times and cut each bird out. 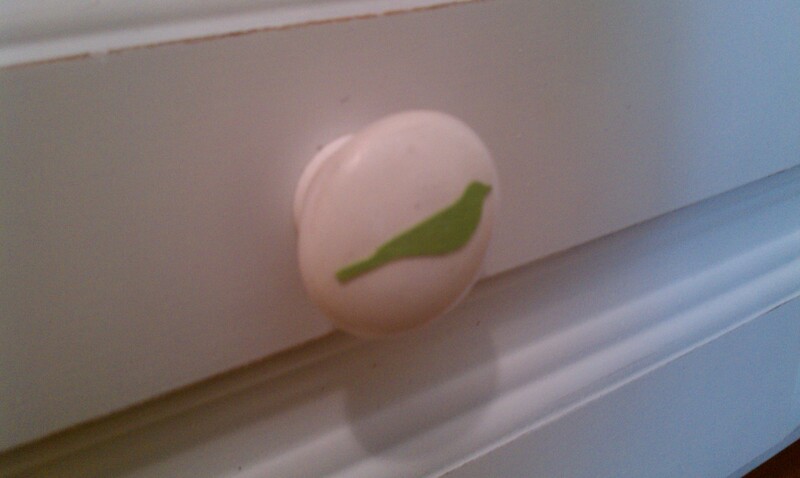 Next, I put a thin layer of Mod Podge on the back of the cut out bird and stuck it right onto the knob. 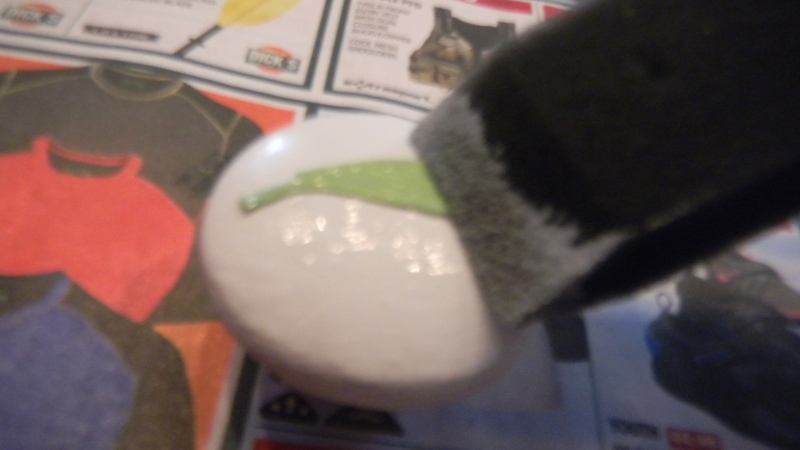 I added a thin layer of Mod Podge to the whole knob. Once that dried, I layered another coat on there for good measure. Once they dried again, Dan screwed them into the dresser. I really like the contrast of the more delicate bird knobs so close to the metal hardware. And now, the dresser is complete! What do you think? Pretty different from start to end. Even though it took a lot of time for the transformation, I think it was totally worth it. The room just looks lightened up, and the new style fits the room so much better. 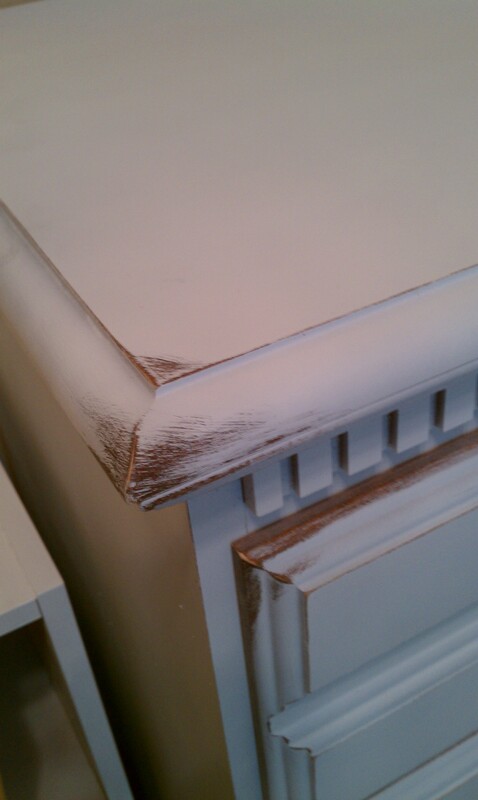 Looking back, I’m not sure if it would have been better to use regular paint (instead of spray paint) on the dresser. 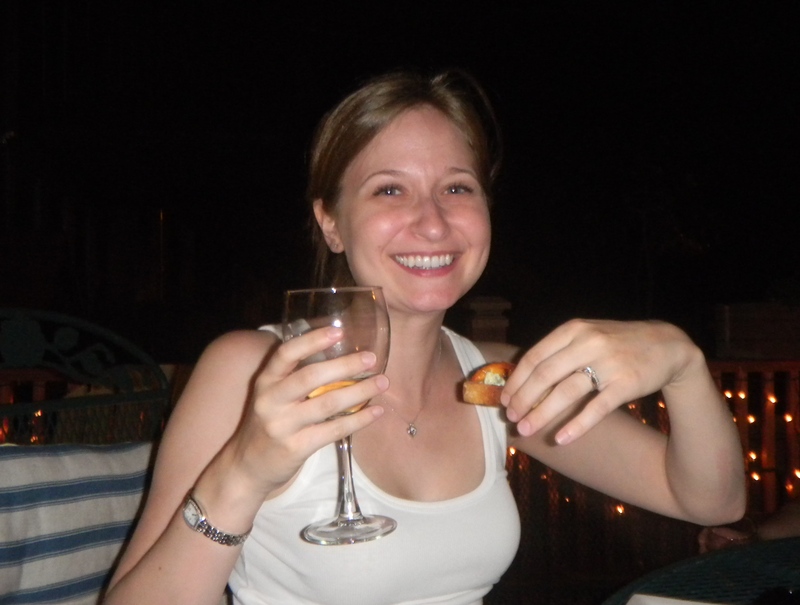 Be on the look out for the first ever special guest blogger post next time to tackle the pros and cons of each. This project has been a couple months in the making. A while back, I ordered a chalkboard sticker in a fun shape. I thought it would be a fun touch in the office, and debated what to do with it. Here’s how it came out. At first, I thought I would stick it to a large piece of wood that I would have painted and distressed before hanging it on the wall. I had some trouble finding some cheap, already distressed looking wood, so I decided to do something else. What if I framed it? I liked that idea. While on the walk home from a dog park near our house, I stopped at a resale shop to see if they had any cheap frames. I was in luck, I found one for $2.80. I planned on painting the frame, but once I got it home and cleaned it, I thought it actually would look nice that it’s a different tone than the painted furniture and the wall. Done. I got out my scrapbook paper supply and saw what I had to work with. I had gotten a bunch of green and yellow patterned sheets while re-doing the office, just in case I wanted to do any small projects. 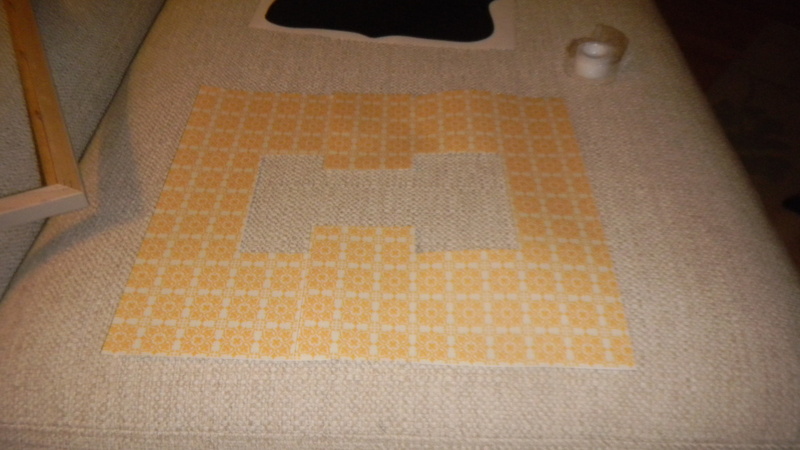 I came across a yellow pattern that seemed to work. 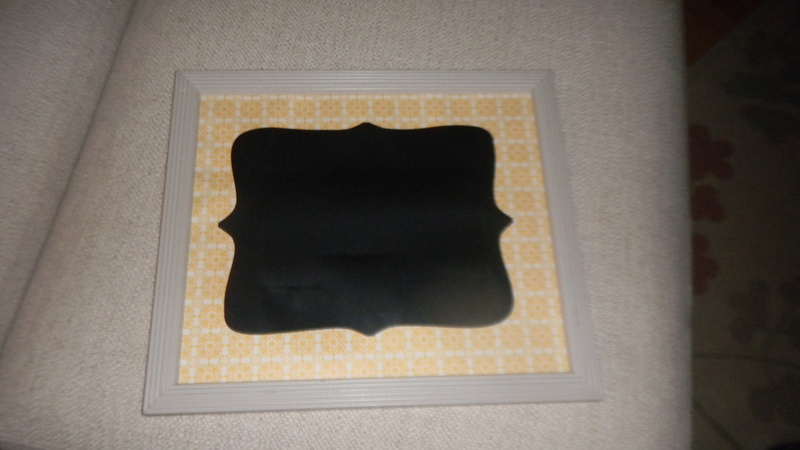 The problem: a standard piece of scrapbook paper is 12×12. The frame was 11×14. Argh. This is where Dan and his fantastic spatial sense entered the picture. He basically cut out a portion of the middle of the paper and used that to cover the parts where you could still see the frame backing. 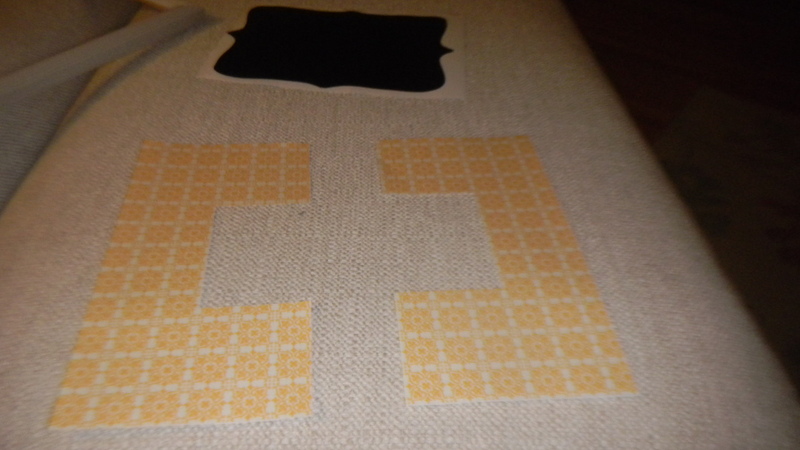 There are some “seams” showing where the paper cuts show, but it is minimally noticeable. We talked about whether we wanted to use this as an actual chalkboard or more for decoration, and the decoration functionality won out. I’m planning to write a funny quote on the chalkboard and then give it a permanent spot on the wall next to the desk. Fourth of July is probably my second favorite holiday, with only Christmas beating it out. Why? 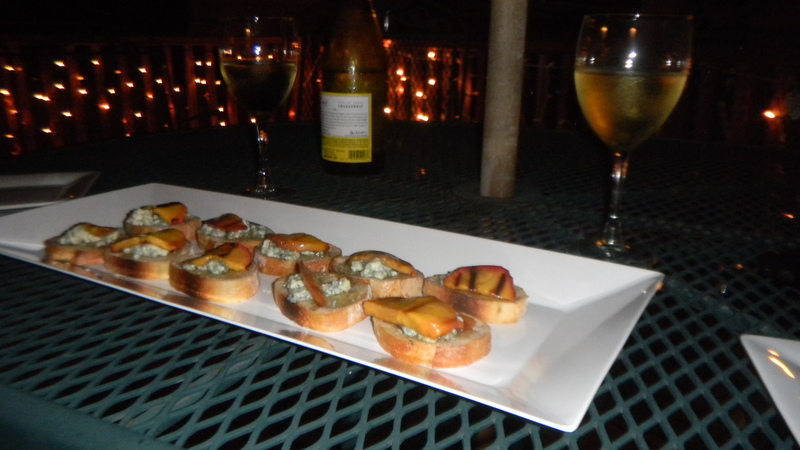 It’s the epitome of summer – BBQs, apple pie, picnics, boating, swimming, and the best part, watching fireworks. Ever since I was a little kid, I’ve spent the holiday with my family at our cottage in Wisconsin. It’s a slower lifestyle there, and I relish the simplicity of life when I’m up that way. No computers, getting around by walking or on boat, sleeping in, and lazy days. We had double the BBQ fun this year with one on Sunday and a last minute celebration on the Fourth itself. 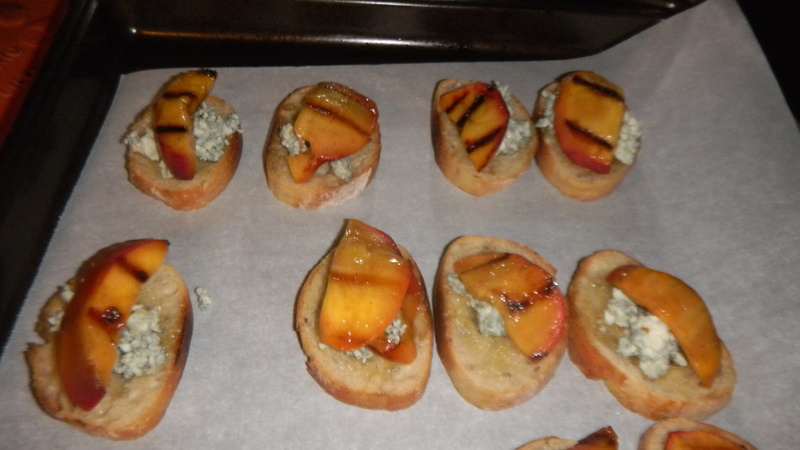 I made a fabulous (and fabulously easy) dessert this year. No traditional blueberry and strawberry flag cake for me. 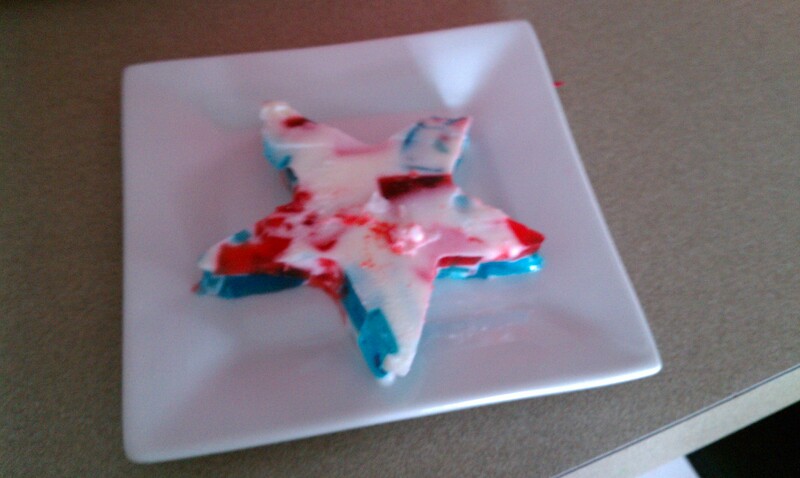 Instead, I googled, and I found these patriotic, amped up jello jigglers. Appealing to the eye and the tastebuds. Even though it’s a few days after the fact, I hope you all had a wonderful Fourth, and I hope you’re all looking forward to the rest of summer as much as I am. 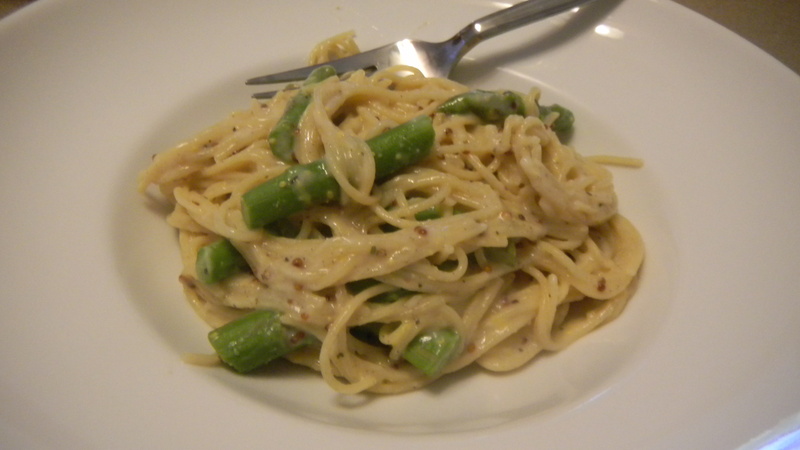 I’m a fan of pasta dishes for a quick weeknight dinner. To keep it light, I usually omit the heavy red sauce and stick with whole wheat pasta. I also try to sneak in some extra veggies where I can. Last night, I was at work late and I had some asparagus that I needed to use up soon. I looked around at what else we had: leftover whole milk from making ice cream and half a lemon and tried to figure out a dish I could make. I think it worked out pretty well. I started by bringing a pot of water to a boil. 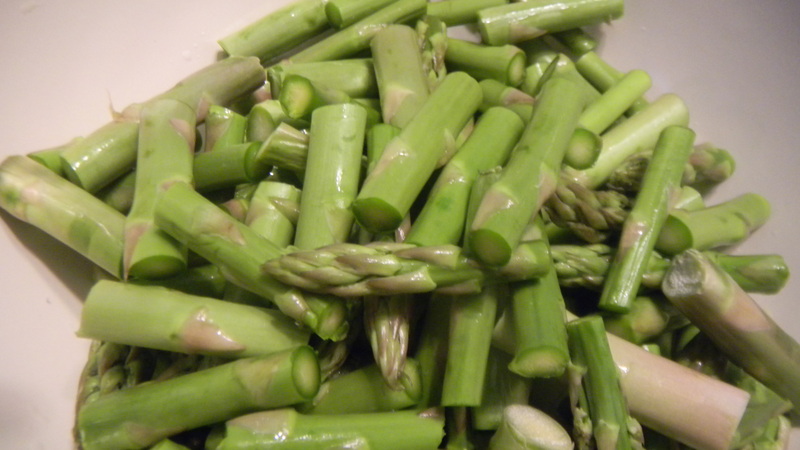 Meanwhile, I cut off the ends of the asparagus and chopped it into pieces that were about an inch long. Once the water boils, dump in the pasta. I let mine cook for about 7 minutes. During the last 3 minutes, I added the asparagus. After all 7 minutes is up, drain the water and return the pasta and asparagus to the pot. 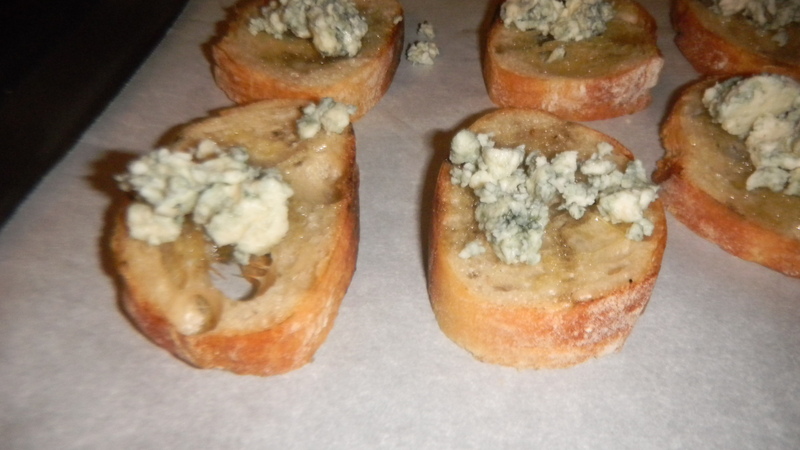 I then began to work on the sauce. 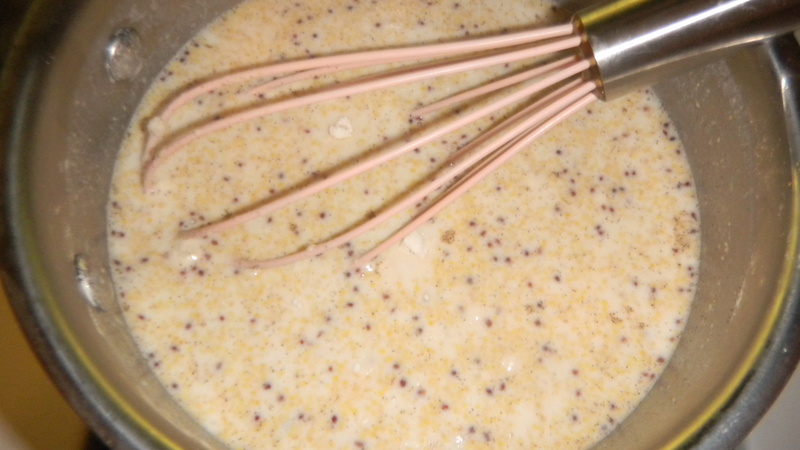 I put the milk, mustard, salt, pepper, flour, and garlic powder into a sauce pan. I heated it, kept stirring, and let the sauce thicken up a bit. 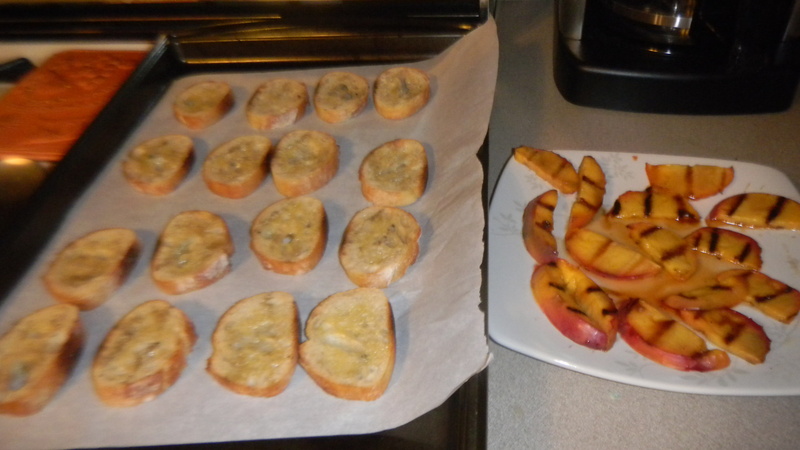 Once the sauce was just about ready, I added in the basil, lemon juice, and lemon zest. Pour the sauce over the pasta and add in the cheese. Stir until the cheese is melted and the pasta is covered with sauce. This recipe works as a great staple and you can add pretty much any type of veggie or even some beans to it. I would suggest broccoli, onion, bell peppers, or even white beans. You can also add in some grilled chicken. For extra heat, definitely try some crushed red pepper. I had a ton for leftovers the next day. Enjoy!